Instantly win a Guy’s Gift Pack from Dove, Save $1 & take the quiz! Take the quiz to discover his scent personality along with other coordinating basics your man will love. 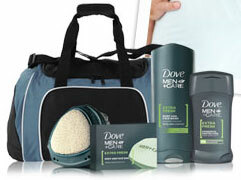 Then play the instant win game to try your luck at scoring a bag stocked with Dove® Men+CareTM products for him. You will need to go to dove.us, sign in or register, and go to offers. I took the quiz but when I got to the place to put in my e-mail there was someones e-mail already there & it won’t let me delete it to enter mine.